Bornholm is a Danish Island east of Denmark and south of Sweden in the Baltic Sea. Its main industries include fishing, arts and craft, glass production, and dairy farming. Bornholm has a long history that goes back to the Vikings. It was a well established trading point with Sweden, Germany, and Poland all within 100 meters. 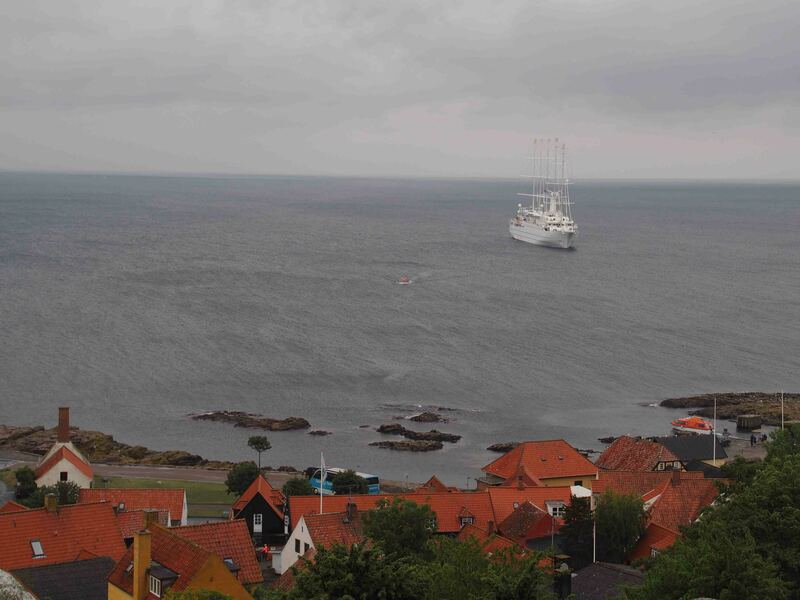 Now Bornholm is a popular travel destination for summer tourists. We didn’t have a tour scheduled for this island, so we were on our own. We took the second tender (basically the cruise ship’s lifeboat) into the harbor Gudhjem at 8:15. At breakfast the skies were as clear as we’ve seen, but by the time we loaded the tender, it was raining. Perhaps we should have waited a while as the sleepy town doesn’t come awake until about 10am, but then again, we were the first to get a hot shower upon return to the boat around noon. Some of the historic sites such as the Hammershus Castle Ruins and the round church were too far from town to walk, so we kept our self-guided tour to two recommended loops around Gudhjem for the best places to visit in Bornholm. Our first, hilly loop took us by a cool windmill which is now a cafe, Gudhjem church with a nice view of the harbor, a very popular campground full of RVs and tents, and a beautiful cemetery. Our second loop took us past its famous chocolate shop, Bech, where we stopped and bought a sample of dark chocolate. Next we stopped at Gudhjem Glasrogeri, a glassblowing site and watched the artist heat and spin the glass. I’ve been to a family friend’s glass blowing presentation, so we only stayed long enough to warm up a bit. Our next stop included a smokehouse famous for its smoked herring with raw egg called Gudhjem Rogeri. We bit the bullet and ordered one plate to share. I’m not too fond of eating fishy flavored fish with bones in them, but the herring grew on us enough to finish half of the small salad plate. The loop continued up the street where we turned left, entered an old gate, and walked across a grassy path to flagpole hill where we could look down on the harbor full Mediterranean tiled roofs. For some reason this stroll along the grassy hill reminded us of Scotland. Now back in town, we stopped at Karamel Kompagniet, a caramel shop. So far, there has been no shortage of food on this trip. Hopefully, I am walking all that I’m eating off.